Below, I’ve summarized how I maintain my own lawn. It’s not possible to cover every detail. Colleges offer degrees in the subjects I cover, so the details will be discussed within reason for the purposes of this article. IMPORTANT: Keep in mind that this works for MY lawn. 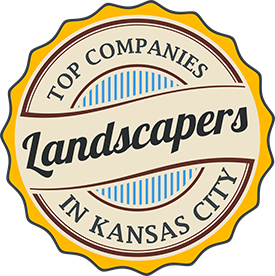 Many of the techniques I use can be used as rule-of-thumb and will apply to many other lawns in Kansas City, Overland Park, and Leawood, but each lawn is different and will have different needs. Of course, we’re always here to help if you have questions. Also, it’s very important to understand that there is not one perfect way to achieve a beautiful lawn. My method may differ from another lawn professional’s method. However, this is what I feel has the best results for the money and effort spent. Lastly, there’s no substitute for experience. Our turf technicians are highly trained and service hundreds of lawns under supervision before they’re allowed to go out on their own. Lawn treatments must be applied correctly, and at the proper time, for good results. My best advice to you is to know your lawn size and make sure you’re applying the proper amount. We can help you determine your lawn size. Also, for granular treatments, make at least two passes of light treatments, and in different directions. This will help you apply the treatment evenly. -Good drainage there are no areas there water puddles after a rainfall. -Lots of sun and airflow. I had to remove a tree that was creating too much shade for a thick turf. Luckily, it was a Bradford Pear that I planned to remove anyway. -Mostly tall fescue with a small amount of bluegrass. -Has an underground irrigation system. -My lawn technicians do all the lawn treatments. My lawn gets the same treatments yours does if you’re using our Optimum turf program and nutsedge control. -Most of the other services are provided by my crews, but I do get out myself to do some of the work when I have time. I like to do the leaf cleanup and shrub trimming. -During the mowing season, I ALWAYS cut at 3.5 inches, with the exception of the first and last cut of the year, which I cut at 3 inches (same height our crews are trained to cut at). -If necessary, clean any new leaves (leaves that accumulated since the fall cleanup) that collect in corners, fence lines, low spots, etc. If leaves pile up and remain in one area for too long, they will smother the grass and kill it. This is when turf damage can happen that often goes unrealized. Failing to clean up the leaves can prevent you from achieving a great lawn. -Apply a “full-rate” concentration of granular Prodiamine based crabgrass pre-emergent. This concentration of herbicide is designed to provide crabgrass protection in a single annual treatment. However, I recommend applying a second “half-rate” treatment in April for best control. The pre-emergent treatment is often mixed with fertilizer, and I HIGHLY recommend using the best fertilizer blend you can find. Fertilizer is not something to cheap out on if you want a beautiful lawn. Since this is not a discussion on how to pick the best fertilizer, I would just recommend asking your sales person for advice. Unfortunately, if you’re applying your own fertilizer, you’ll be limited to relatively small amount of choices. You’ll want to find something with a medium nitrogen content, and has a blend of slow release, quick release, and micronutrients if possible. Applying the pre-emergent now will give the herbicide time to disperse into the soil and protect against many spring weeds, in addition to crabgrass. IMPORTANT: Be very certain that you are applying a pre-emergent that contains Prodiamine. If you use a product that contains Dimension (another very common pre-emergent herbicide), you will be applying it too early for effective results. Read the label or ask your salesman for help choosing the correct product. Now is the time to cut back any deciduous shrubs that have outgrown their space. Drastic cutting can be done at this point. You want to cut them back before they sprout leaves, but also minimize the time that the cut wounds remain open. Soon they will begin to grow and heal themselves. -Blanket spray for broadleaf weeds. Use a three way or similar herbicide (Trimec). Mix and dilute per the instructions. Many cold season weeds and dandelions appear in early spring. Now is a good time to get ahead of them. -Before the lawn begins growing, mow it at 3 inches. This will clean up the lawn and stimulate its growth to get an early green appearance. NOTE: This is not something our mowing crews do automatically. We find that most of our clients would prefer to save the money and wait until the grass begins to grow. If you’d like us to cut it short early, just let us know. Unless we’ve had an extremely dry previous few weeks, lawn watering will not be necessary. -Trim ornamental grasses, lilies, liriope, and roses. Roses will need to have any deadwood pruned and cut back to the appropriate height. Most roses can tolerate severe cutback to anywhere between 6-24 inches, depending on the variety. -Clean leaves from corners, edges, and landscape beds. -Spot spray for weeds in landscape beds. Keeping up with them early will prevent bigger problems during the season. -Second spring blanket spray for broadleaf weeds. New weeds will appear since the first treatment, and a second treatment will be necessary. Apply “split application” or “half-rate” treatment of Dimension based pre-emergent. This treatment will extend the crabgrass protection into late summer. -Weekly mowing at a height of 3.5”. Watering is rarely needed during this period. Spring rainfall is typically plenty to keep the lawn in good shape. Only water during unusually hot and dry periods that last over a week to ten days. -Spot spray for landscape weeds. -Prune Mugo pines and Alberta spruce. Only trim the “candles” of the pines, and the soft new growth of the spruce. Use hand shears and be careful not to damage old growth. To shape, use hand pruners to remove branches at their base. -I apply a 3-month 100% slow release fertilizer. This fertilizer is included in our program and is very difficult for a homeowner to locate. In fact, only one other (highly respected) company offers it in the Kansas City area. It’s expensive, but it will slowly feed the lawn throughout the summer. Our supplier does not sell to the public, so it’s unlikely that you’ll find this fertilizer. Instead, you can apply a low to mid-rate fertilizer with the highest slow release percentage you can find. Ask your garden salesman for help finding it. Since the fertilizer will likely only be a 5-6 week release, you’ll probably need to reapply in August. -Apply grub control before July 4th. -Blanket spray for nutsedge weeds, if necessary. If you’re doing this yourself, you may be able to achieve acceptable results by spot spraying. It will depend on how much of the weed you have in your lawn. There’s two common herbicides used for spraying nutsedge. The less expensive option will contain Sulfentrazone, but I DO NOT recommend using it. Check the active ingredients label and avoid this herbicide. It is very easy to over apply and kill spots in your lawn. Even our trained technicians do not use it. Instead, I recommend a product called Sedgehammer. It can be expensive, but it’s better than killing your lawn! -Spot spray for broadleaf weeds in turf areas. Once the spring rains have ended and the heat increases, I water twice a week for 45 minutes per zone (25 minutes for zones that have fan sprayer nozzles). I much prefer to water for longer periods, but less frequently. This allows the water to seep deeper into the ground, and the surface to dry out between watering cycles, therefore minimizing the chances for turf disease. This method will allow the turf to go dormant but keeps it healthy. If you require a dark green color all season, you’ll need to water much more frequently, but may experience problems with disease. For best water efficiency, water in the early morning hours before the sun comes up. Also, do not water on the day of, or day after your scheduled mowing day, in case we are delayed by weather. -Trim all shrubs that need it in late June to mid-July. -Spot spray for weeds in landscape beds. Spot spray for nutsedge and broadleaf weeds. Spot spray for weeds in landscape beds. -Aerate and seed. Verticut if necessary to fill in any bare spots. I do some sort of seeding each year. At minimum, I will aerate and seed. This maintains a soil quality and keeps the lawn thick. If there are any bare spots, I will also verticut to fill them in. -Apply starter fertilizer that also contains root stimulator. Many factors create a beautiful lawn. However, annual seeding probably has the single biggest impact to creating a lawn that “wows” your neighbors. You just can’t beat the appearance of a thick lawn that doesn’t have thin areas or bare spots. Thick lawns also help prevent weeds. If you have thin or bare areas, something will grow there, and it usually isn’t turf grass. If you’ve seeded your lawn, follow the instructions for watering After over-seeding, found on our website, or contact us and we can email you a copy. VERY IMPORTANT: If you use us or another company to mow your lawn, it is very important that you turn off the watering a couple days before each mowing to allow the surface to dry out. After seeding, the ground will be wet and the large commercial mowers can easily damage the new grass, no matter how careful the operator is. If possible, you can even push mow the lawn for a couple weeks after it’s been seeded. If you did not seed your lawn, use the summer watering instructions, but reduce the watering times by up to 50%, depending on rainfall and current daytime temperatures. Blanket spray for broadleaf weeds. Many weeds, including dandelion, germinate in fall. Spraying for them now will eliminate them and reduce the number of weeds that grow the following spring. If you have already used a 2, 4-D formulation two times earlier in the season, you will need to use a different broadleaf product for this treatment. State regulations prohibit using 2, 4-D as a blanket spray more than twice per year. Alternatively, you can spot spray as many times as you’d like, but the results may not be as good. Once or twice a week, 10-15 minutes per zone, if necessary in absence of rainfall. Spot spray for weeds. Trim all shrubs that need it. -Apply high nitrogen winterizer fertilizer. This can be done even if there are leaves on the ground. The vast majority of granules will fall right through the leaves. Any granules that stay on top of the leaves will fall once the leaves are disturbed by wind, a mower, a rake, or rinsed off by rain. The leaves will not reduce the effectiveness of the treatment. -Full leaf cleanup. Remove leaves from turf areas and landscape beds. No watering necessary. Most sprinkler systems will be winterized by early to mid-November. Short of writing several books on the subject, it’s simply not possible to talk about every important detail of great lawn maintenance practices. Your lawn is unique. So, if you have any questions about your lawn, or need help, we’re here for you! Advice is always free, and if you need someone to do the work, we’re happy to help with that too.